Squier by Fender Affinity basses are great choices for beginners. The best bass for a beginner is one that makes learning enjoyable. It’s smart to keep the budget under $200, and you can find some great basses out there in that price range. Fender, Ibanez, Yamaha and ESP are some of the best names in the music industry, and they all offer starter instruments that won’t break your wallet. It can be tempting to pick up a super-cheap bass from a big-box store when first starting out, but remember: Just like anything else in life, you get what you pay for. To give a newbie bassist the best chance of success it’s smart to start them off with something that sounds good, looks good and is enjoyable to play. New bassists should strongly consider starting on a four-string bass. Even though the five-string bass has become very popular, especially in heavier rock genres, for a musician just starting out it is important to understand the basics of the instrument before branching out to more advanced ideas. New guitar players are often frustrated with the difficulty of fretting notes and chords. For a beginning bassist, because the instrument is so much larger and the strings are heavier, this is even more of a concern. One remedy is for a new bassist to choose a bass with a thinner neck, which is therefore more comfortable to play. Above all else, bassists just starting out should choose instruments that sound good, and look good. It’s important for a newbie to be inspired to pick up the bass and practice every day, and if their bass is a dud they are less likely to do so. Below you’ll find five basses that meet the listed criteria. In most cases they are budget versions of expensive basses made some of the top bass brands in the world. They sound good for basses in their price range, and they a lot look like their big brothers.These are the kinds of basses that provide inspiration for newbies! And they all come in under $200 as of this writing. That's a good ballpark budget for a first bass. Many new bassists choose starter kits to get all the gear they need to start playing in one handy package. 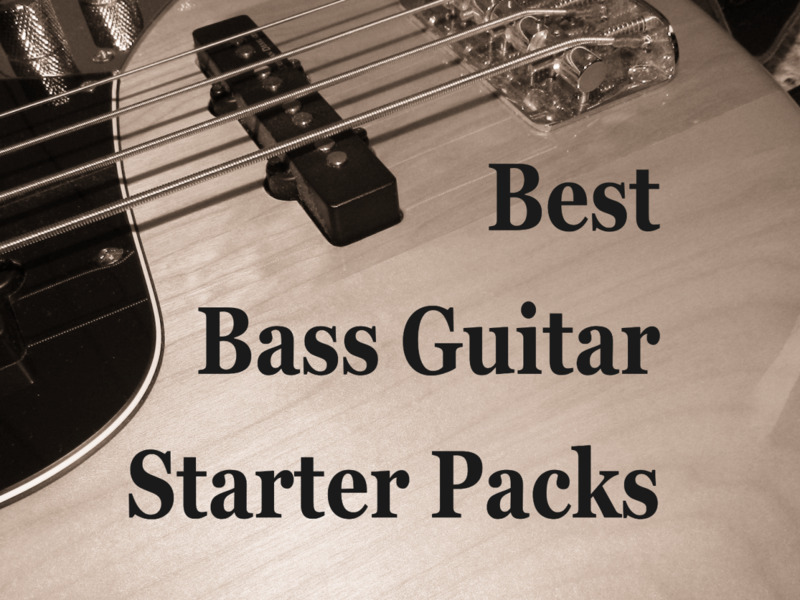 These packages come from some of the top names in the bass world, and contain a bass, amp, cables, picks, lesson materials and all the accessories you need. 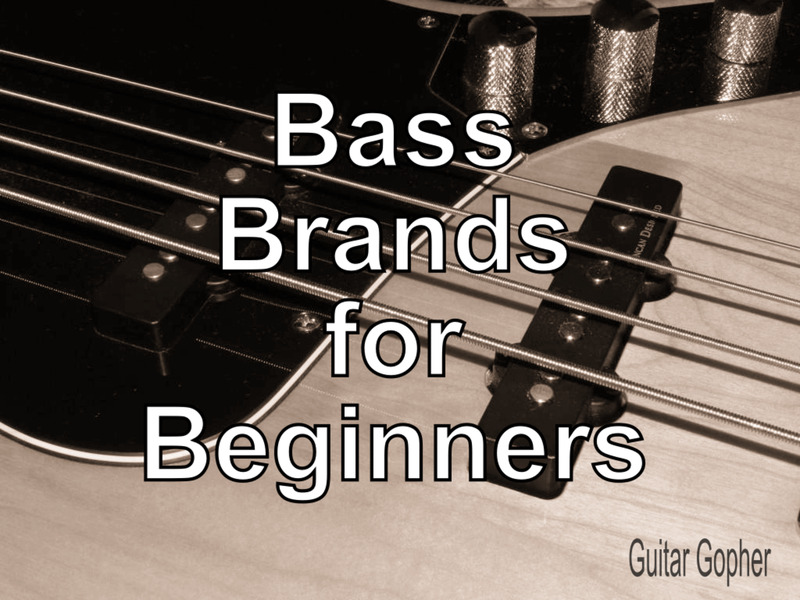 Otherwise, let's check out some affordable bass guitars for beginners! Squier basses are made by Fender, one of the most famous guitar companies in the world. The Fender Jazz Bass has been a favorite of musicians in all kinds of genres for decades, from jazz to blues to country and even hard rock. But with a price tag of over $1,000 it’s not exactly the kind of instrument a beginner would play! And this is where the Squier line comes in. Through Squier Fender can offer low-budget instruments based on their classic designs, and start a new generation of bassists off on the right foot. My Opinion: I love the Fender Jazz Bass. I personally own a Squier Vintage Modified Jazz Bass, which is a few steps up from the Affinity, and it’s a great bass. The Affinity is a very nice bass for the price, but I don't put it at the top of the list, unless a newbie is looking specifically for a Jazz Bass. For decades the Fender Jazz Bass sound has touched genres as diverse as rock, country, metal and, of course, jazz. This is a classic design by Fender, based on one of their most legendary instruments. For newbies looking for their first guitar it is hard to beat the Squier Affinity version. Squier bass guitars are affordable instruments made for beginners, but remember that they all must meet Fender's high standards. 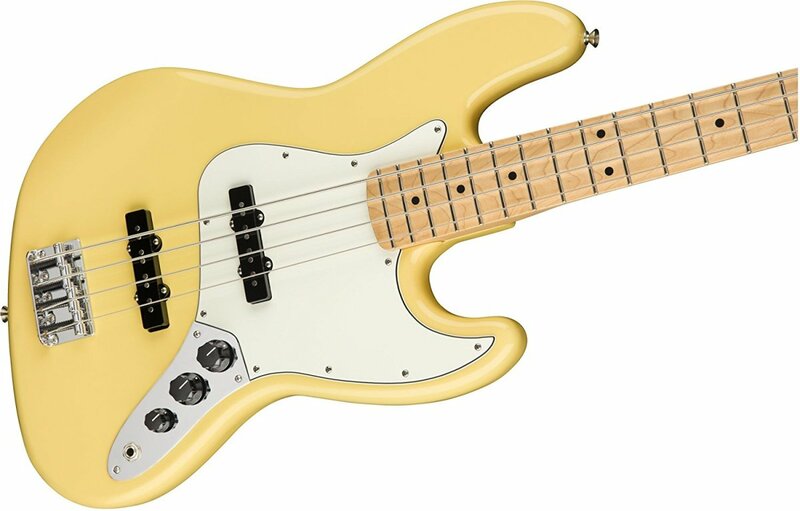 Another affordable instrument based around a classic Fender design. So what are the differences between the Precision and the Jazz? The Precision Bass has a slightly larger body and, more importantly for beginners, a slightly thicker neck. 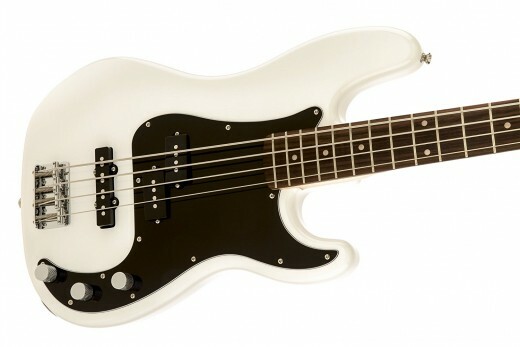 The traditional P-Bass has a single pickup, compared to the dual pickup Jazz Bass. This means the Jazz is capable of a wider array of tones. The sound of the Precision tends to be punchier, and more applicable to rock music, though P-basses have certainly been used effectively in jazz, country, funk, and just about every other style of music. 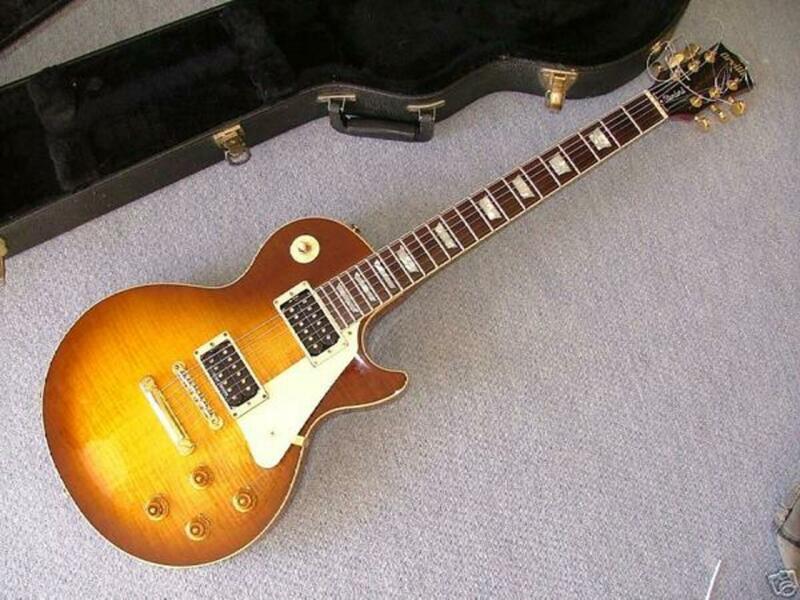 However, in the case of the PJ we see the addition of a jazz-style pickup at the bridge. That means a wider arrange of tones for newbies to explore. 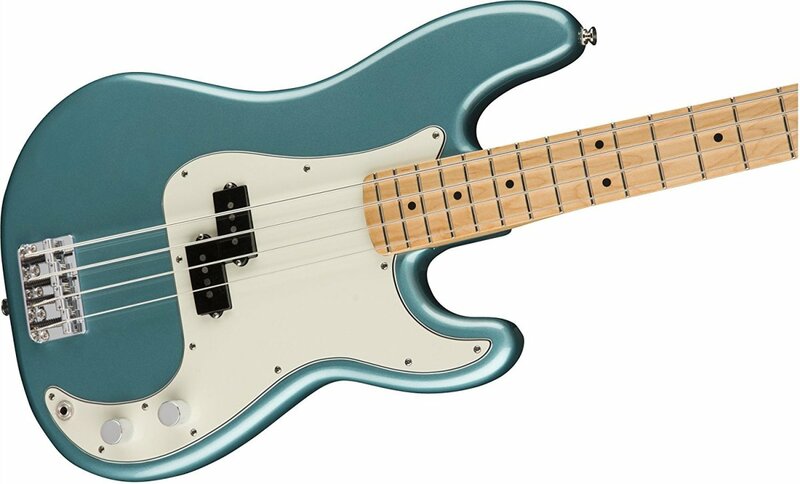 My Opinion: The Precision Bass is great for musicians who want an aggressive tone. When it comes to budget Squiers, I have always thought that the Precision sounds more like a Precision Bass should, than the Jazz sounds like a Jazz Bass should. Again, a great bass for starters, but maybe not #1 on the list unless a newbie knows a Precision Bass is definitely what they want. The Fender Precision Bass sound is deep, punchy and aggressive, and it has certainly found a home in heavier forms of music. But one pickup goes a long way with this bass, and the P-Bass is as adept in rock, country and jazz as it is in hard rock. This Squier Affinity version gives newbies an opportunity to start their music careers off with a real Fender classic. Ibanez is a company known for making great heavy metal guitars, but many a rock and jazz musician has found great value in Ibanez basses as well. Like their guitars, Ibanez basses are known for having thin, fast necks. Their Soundgear line in particular is well-suited to new players, or those who just want the fastest necks they can find. Soundgear basses also have slightly narrower string spacing when compare to the Squiers above. This means they’re a little better suited to playing with a pick. My Opinion: During my days of playing in metal bands Ibanez Soundgear basses were among my main basses. The higher-end models are amazing instruments, and the baby GSR is a great starter bass for anyone looking to walk that metal path. I put this bass high up on the list of best choices for newbies. Ibanez Soundgear basses are versatile, and because of their thin necks they are a little easier for beginners to play. The Ibanez Gio lineup brings the legendary SR style down to a price beginning bassists can afford. Yamaha is another elite bass manufacturer that gives the newbie a great bang for their buck. The TRBX174 is a no-frills, quality bass with a great style, and like the Ibanez it’s easy to play. Yamaha is best known in the genres of jazz and rock, but this starter bass can walk the line between any genre. The TRBX174 also comes in an EW model, featuring more exotic woods and finishes. This might not be a concern for more newbie bassists, but for a price bump of only a few dollars it’s a nice option. My Opinion: I’ve always liked Yamaha basses. They sound amazing, and even the lower-end models are known for great tone. I feel the Ibanez is a notch above, but I’d put this Yamaha right in there with the Squiers. Like the Ibanez, the Yamaha TRBX174 is a versatile bass that combines P and J style pickups. This bass is a great choice for newbies who are into many different genres of music. ESP LTD guitars are generally geared more toward the hard rock and heavy metal crowd, but the B-10 has a look that would fit just about any genre. Like a Precision Bass, it’s a single-pickup instrument, so you’ll get that punchy tone. Compared to a Squier Precision Bass, the neck is faster and a bit thinner. It offers less tonal variety than the Ibanez or Yamaha, but has a similar modern feel and a great sound. 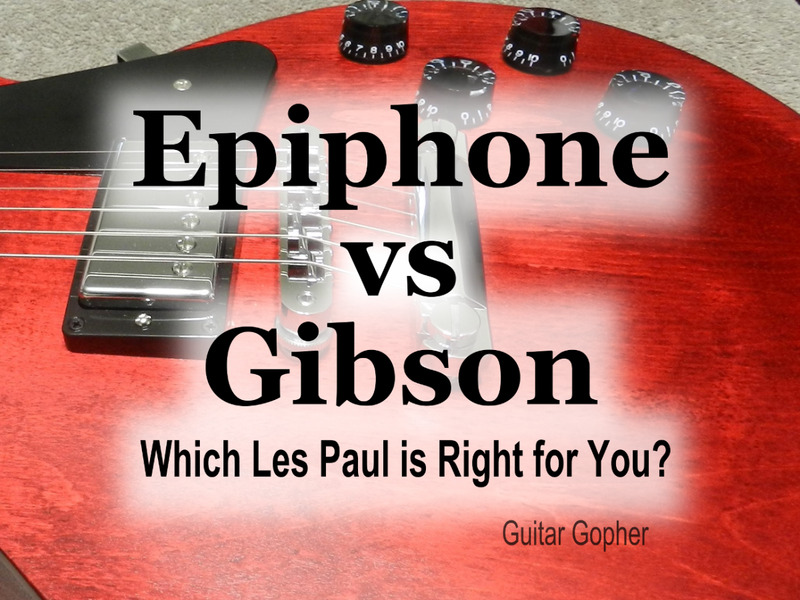 My Opinion: ESP is just plain known for good stuff, and that carries over to their LTD line. This quality, along with its neck and build, put it right up there with the Ibanez as my personal picks for best basses for beginners under $200. A Precision Bass vibe with a metal attitude. The LTD B-10 is a no-nonsense bass for beginners who are into heavier music. However like a P-Bass, you can dial it back and experiment in jazz and lighter rock if you want to. One pickup is all you need. ESP LTD is known for building great intermediate and beginner-level guitars and the LTD B-10 comes through. None of these basses stand head and shoulders above the others, but depending on the musical inclinations of the newbie they may prefer one over the rest. For players who want a traditional bass, and have aspirations of moving up to a Fender Jazz or Precision Bass someday, the Squier Affinity basses are great options. They’re good sounding, solid instruments based on the classic designs that have shaped music of every genre. If something a little more modern is desired, the Ibanez or ESP-LTD basses are great choices. Especially for those who are into metal, and those who expect to play with a pick, these basses will shine. The Yamaha is perhaps the best all-around bass, with a wide range of available tones and a high standard of quality. What you go with is your choice, but remember to keep the price under control, because you’re going to need to buy an amplifier too. Did you forget about the amp? A Squier by Fender Starter Pack is a great idea for beginners. Yes, a beginning bassist is going to need an amp, a cable, a strap, maybe some picks, extra strings and all of that good stuff. Many instrument manufacturers make packages that include everything a new bassist needs to get playing. In my opinion Fender is at the top of the heap. With the Fender Stop Dreaming Start Playing Affinity packs you get your choice of a Squier Affinity Jazz or Precision Bass plus a gig bag, strap, cable, stereo headphones and an instructional DVD to teach you to play the thing. But the one piece of gear that makes these packs stand out above the others is the amplifier that’s included. The Fender Rumble 15 is an awesome little amp. By itself it costs about $100, and you’ll struggle to find something that sounds as good and is built this well in that price range. The amp is great for beginners, but also useful to veterans as a practice amp or even coffee-house gigs. This means, even after a newbie bassist outgrows the beginner bass and moves up to a better instrument and bigger amp, they’ll still get a lot of use out of the Rumble 15. 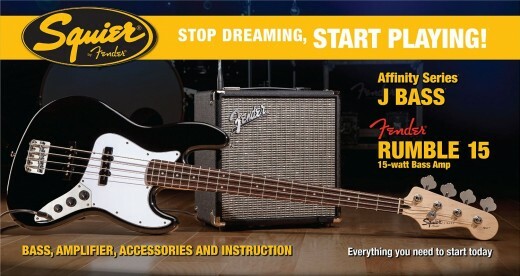 With the Squier by Fender Stop Dreaming Start Playing starter kit you get everything you need to start learning bass today. These kits are great values for beginners as you save nice chunk of cash compared to getting everything separately. The first instrument is always the toughest to buy. After a bassist is playing for a while they’ll have an idea of what they like and don’t like, but for now, in most ways, they have no clue. All you can do is make the best decision you can based on the information available. For now, you can’t go wrong with any of the basses and packages listed above. They’re all great starter instruments for the beginning bass player. Ibanez is the way to go! Yamaha has what I need! ESP LTD is hard to pass up! The reason why I like the bass compared to the guitar is the sound of the bass. I like it's throaty sound and the lower pitch compared to the guitar. You're The Supporting Cast and you're the member as well as a drummer that's keeping the band grounded meaning you're the meat and potatoes and you're keeping the Rhythm aspect of the band going. It's not so much a background instrument anymore for the most part it's starting to become the lead instrument. You could do without a guitar in my opinion as long as you have bass and drums a keyboard player and even a horn section I think you're good to go. My favorite bases are... John Entwistle of The Who, John Paul Jones of Led Zeppelin, Billy Cox and Noel Redding of Jimi Hendrix and the band of gypsys and the experience, John Parish of rare earth, Verdine White of Earth Wind & Fire just to name a few but they are the backbone of the group and just as important. I admire and look up to these guys. Oh must I forget there are a couple of females that are just as good at playing bass Rhonda Smith and Tal Wilkenfeld both who have played with legendary guitar player Jeff Beck. Hi Vladamir! Congrats on your decision. The best advice I can give is just play as much as you can, and listen as much as you can. Those books you have are a good start. Work on the lessons there, but also play on your own. The more hours you can spend with the bass in your hands the better you will get. Listen to as much music as you can, especially bands with great bassists. And don't quit when things seem tough. The players who get good are the ones who don't give up! Good luck! Thank you. Nice post. I ended buying the Yamaha TRBX174 because after I heard some videos and read some reviews it's sound is better than Ibanez. I also bought the Hal Leonard bass method (books 1,2,3) and Bass Guitar for dummies. What advise can you give me in my journey? Thanks Cory! Good luck learning bass. You're going to have a blast! this was a great writeup and answered alot of questions I needed answered. Not to mention the ones I didn't know I needed to know. Greatly appreciated this! Im excited to get started. @ Fred: I don't believe Vester exists anymore. Some people really liked them though. If you can find a used bass for a good price go for it.